STAT!Ref will be hosting an informative webinar with the creator and CEO of BoardVitals on Friday, May 29th at 11:00 Eastern/10:00 Central/9:00 Mountain/8:00 Pacific. Please click below to register for this important event. 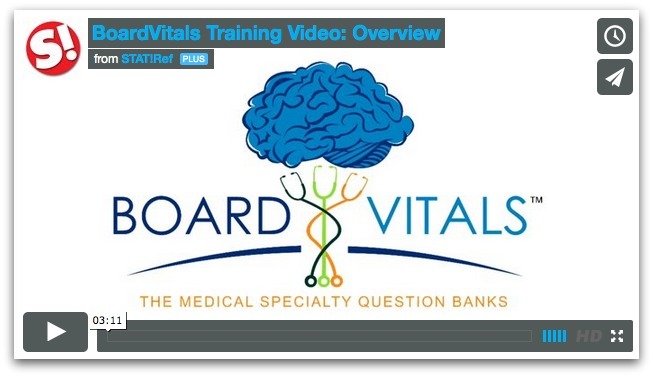 BoardVitals now features question banks for 17 medical board specialties, Shelf Exams, USMLE Step 1, 2 and 3, NCLEX RN and PN, FNP, COMLEX, Surgical Tech, NBDE, NAPLEX, PANCE and is growing soon. In addition to constant content improvements, BoardVitals has enhanced the administrative features of the product. View the overview video below.